Bookstores on the road, and a giveaway! In going through photos of my travels over the past several years, I’ve noticed a recurring subject during my travels. For some reason, whenever I see a bookstore, I grab a picture. Not a “big name” book store—you know the ones, and I don’t need to mention them. But I like to find the not-big-name stores, the independents, because it seems they’re a dwindling breed. Formerly Johnson’s Bookstore – Springfield, Mass. 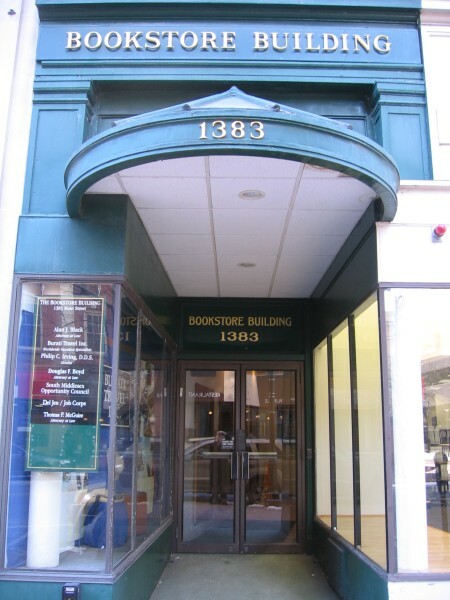 My favorite bookstore of all time was Johnson’s Bookstore in Springfield, Massachusetts, which opened in the late 1800s. The place closed its doors in 1998 after three generations of the Johnson family ran the store. Its top floor—the treasure trove—was one entire floor of used books. The floor had an old book smell, if you know what I mean. It was the smell of secrets, of discoveries waiting to be made inside the thousands of books, some rare, some paperback novels a few years old. One fun “score” of my was finding an early edition of Black Beauty which is still on my bookshelf today. Other scores were favorite books from childhood, obscure titles I thought I’d never see again. After Johnson’s closed, the property was restored and is now multi-unit shopping. I’ve not been back inside since moving to Texas in 1992, but every once in a while I think of Johnson’s. I wonder if they were able to get the old book smell out of the top floor. Part of me hopes they couldn’t. Several years ago, I went with my husband to Galveston, Texas for a conference. We stayed at the historic Tremont Hotel, and our first night after supper, we went on a stroll throughout the historic downtown area, not far from The Strand. 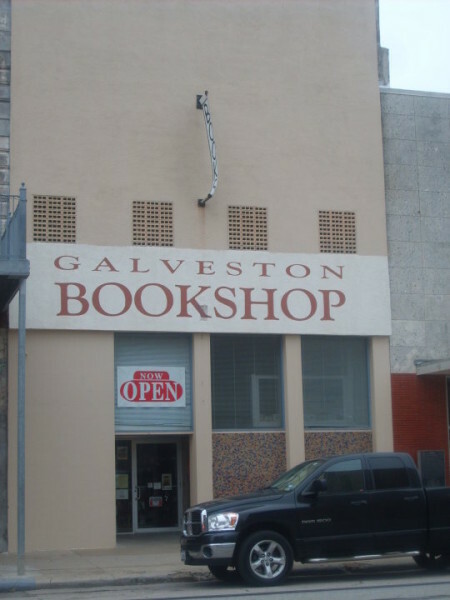 I came across the Galveston Bookshop, open since 1991, and it boasts 70,000 volumes of new and used books. I love used books. Even as an author, I don’t mind used books. I’ve discovered some new favorite authors by purchasing a used book. 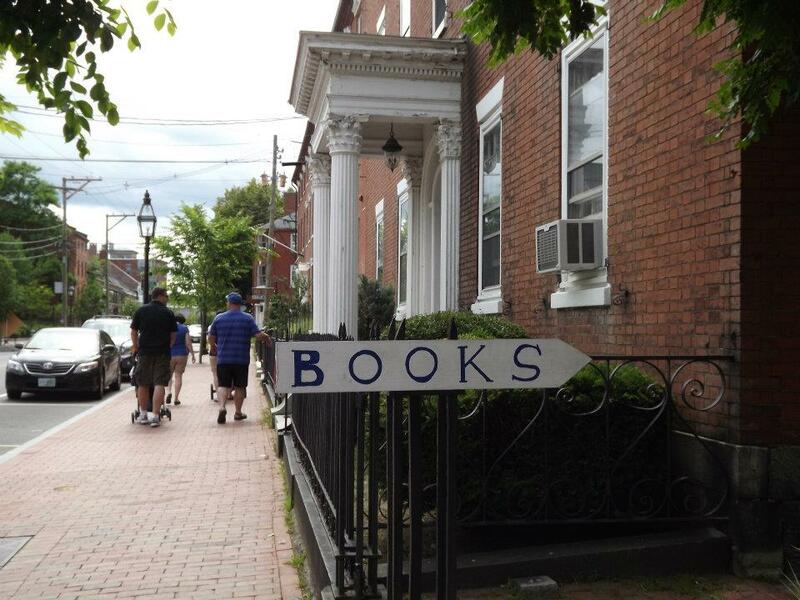 Two years ago, we visited family in New England, and I grabbed photos of bookstores in Boston and Portsmouth, New Hampshire. 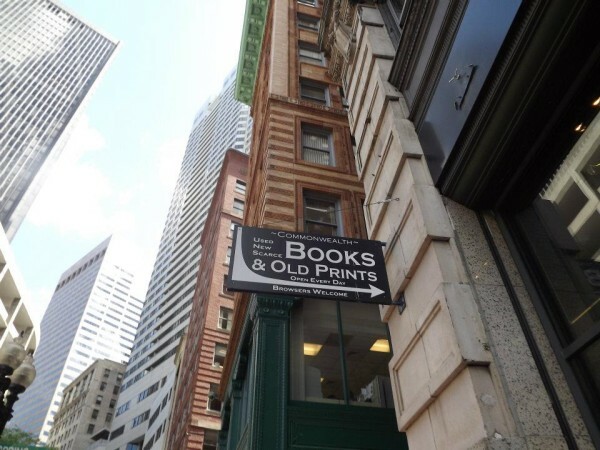 When walking from the T station to Boston Harbor, my husband and I passed Commonwealth Books, at Downtown Crossing, on the oldest street in the city, dating from 1630. They have 40,000+ books to browse through, along with prints from the 1600s on. Wow! Then, a few days later, we took a family outing and stopped in Portsmouth, New Hampshire and walked the downtown streets. This time, I only found a simple sign in the shape of an arrow marked “BOOKS, pointing to a side alley. I never discovered anything more about that place, but it was likely another little hole-in-the-wall of discovery. Much closer to home, there’s Fredericksburg, Texas, and Books On Main, located on where else, Main Street? 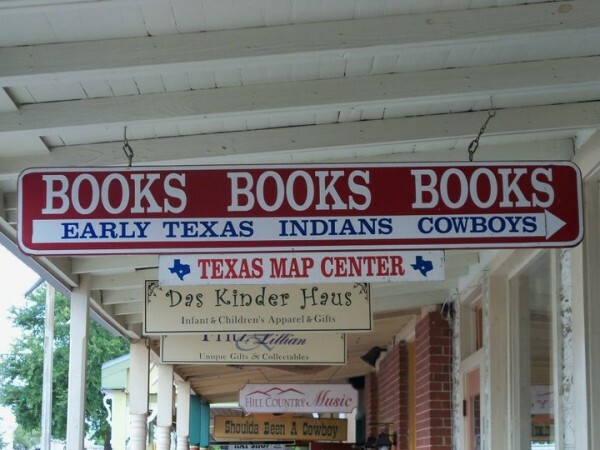 This store has lots of Texas books as well as maps and genealogy resources. What about you? Is there a special bookstore you’ve come across in your travels, or close to home? One more thing! 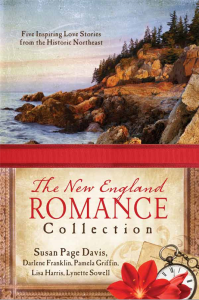 I’m having a giveaway of TWO copies of the New England Romance Collection, a set of five historical romances set in each of the New England states. My standalone title, All That Glitters (2010 Carol Awards finalist), set in Newport, Rhode Island, is among the novels. Lynette, cool bookstores. We recently returned to the town where we lived in Florida. They used to have to bookstores on Centre Street. One closed, and I was happy to see that the other one was still open. I bought books for my grandchildren. This store has a lot of books about pirates since the area’s history is filled with pirate stories. I bought a book about a pirate princess for my granddaughter. Our local bookstore closed :( But, when we are traveling. I scout out small bookstores and shop there — for both new and used book. Please accept my entry in your giveaway. Thank you. Here in rural BC, Canada, we still have a variety of indie bookstores, many of them serving coffee etc to supplement the income. My local bookstore, Black Bear Books, has really welcomed me as a local author.